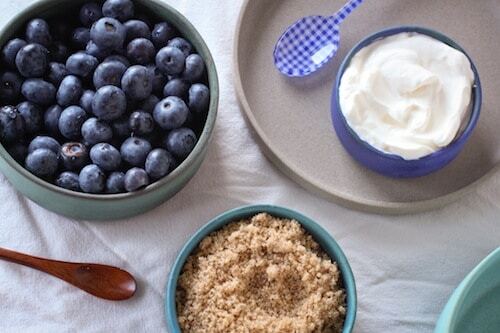 It’s barely a recipe: a heap of blueberries in a bowl, dolloped with as much or as little sour cream as you want to lavish them with, then sprinkled with brown sugar (light brown, dark brown, Muscovado, palm sugar… no choice is a bad choice), keeping it as tart or making it as sweet as you desire. That’s what made it so appealing to me as a seven-year-old who could barely reach the Formica counter, let alone the bent metal measuring cups and spoons, and make her own meals. I love that my mom didn’t question—at least, not to my face—why a little kid would repeatedly borrow a cookbook from the library, letting me throw The Wonderful Wizard of Oz Cook Book into the constant rotation of A Wrinkle in Time, From the Mixed-Up Files of Mrs. Basil E. Frankweiler, the Ramona Quimby series, and the Rainbow Brite and Fraggle Rock LPs cycling in and out of our home every few weeks. The book (now out of print, though used copies are happily and affordably available on Amazon) was a clever precursor to the Harry Potter cookbook, the Narnia cookbook, and today’s overwhelming number of children’s entertainment tie-ins. The foods in each chapter follow a color scheme—brown for Kansas, blue for the Munchkins, and, naturally, yellow for the Yellow Brick Road and green for the Emerald City of Oz. The recipes pull no punches based on their young target market: taffy and sponge candy instructions call for candy thermometers; others, like Tin Woodman Chips, require deep-frying. And, even more interestingly, the book is a companion not to the famous Judy Garland film, but to the original L. Frank Baum series, referencing characters like the Winkies (who live in the West) and the Quadlings (who live in the South, ruled by Glinda the Good Witch)! 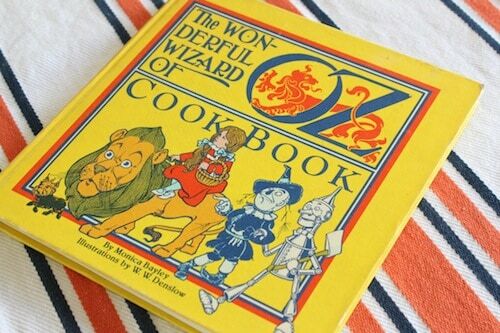 Not that I would have been allowed to experiment with boiling oil or molten sugar, but I didn’t make very many dishes from The Wonderful Wizard of Oz Cook Book. 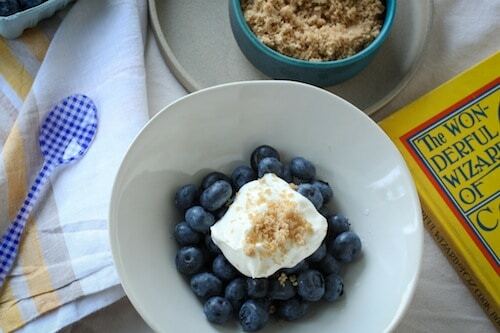 The recipe, such as it is, for Blueberries & Cream (which doesn’t even contain exact measurements in the book version) is as complex as I got as a nascent home cook. The one-two-three snack, simplistic though it might be, was surprisingly effective at introducing me—and other budding cooks, no doubt—to how flavors surprise and delight when paired in unexpected combinations. The oddity of pairing savory sour cream with fruit, then topping it with pure sugar, a substance otherwise restricted in our house to morning oatmeal and baked goods, was just experimental enough to catch my attention and easy enough to execute without adult supervision. It was lifelong love at first bite. Once that nostalgic itch has been satisfied, I’m free to make blueberry pies and jams, swirl them into yogurt, eat them plain and cold from the fridge, or blend and batter them into cakes. But, as a girl who regularly trotted through the same roster of reading material again and again and again as a kid, I know I’ll always return to this recipe. It’s a comfort. It’s like home. And we know there’s no place like that.